Murphy beds are great for maximizing the space of a room. However, many buyers of Murphy beds have never actually seen one in person. I was once in this same situation and it led me to wonder. How do I install a Murphy bed? A Murphy bed usually doesn’t require a whole lot of installation. In most cases, you’ll be able to stand it up flush with your wall and fit it with screws. In other cases, you’ll need to attach it to a stud for extra stability. How do Murphy Beds Work? Can You Use a Regular Mattress with a Murphy Bed? Vertically mounted Murphy beds are more likely to require additional installation steps when compared to horizontally mounted Murphy beds. This is because horizontally mounted Murphy beds have a lower center of gravity and they are much less likely to tip over when compared to their vertically mounted counterparts. The first step to installing your Murphy bed will be to choose a place to put it and then find the nearby studs. Studs are usually spaced out every 16″ but they can also be spaced out at 12″ and even 24″ depending on the building. If you’re adept at finding studs by knocking on the wall then feel free to forego using a stud finder. However, if you’re unsure about whether or not you can successfully hear a stud, you’ll want to go ahead and buy a stud finder. These items aren’t that expensive and they don’t take up much room in a toolbox so it never hurts to have one on hand. Stud finders use electromagnets to find the stud and you won’t have to do much besides turning them on and run them along the wall until they beep. Some stud finders will beep and light up as well so you shouldn’t have any trouble identifying when your stud finder has found a stud. One thought to keep in mind is that other large masses can cause a false reading. Items like large pipes and electrical boxes could set off your stud finder. Because of this, you’ll want to find two or more studs and check to see if they are spaced out at regular intervals. This will verify that you’ve indeed found a stud and will ensure that you don’t accidentally drill into your plumbing system. Once you’ve found your studs, you’ll need to drill holes so that you can attach your angle brackets to the wall. 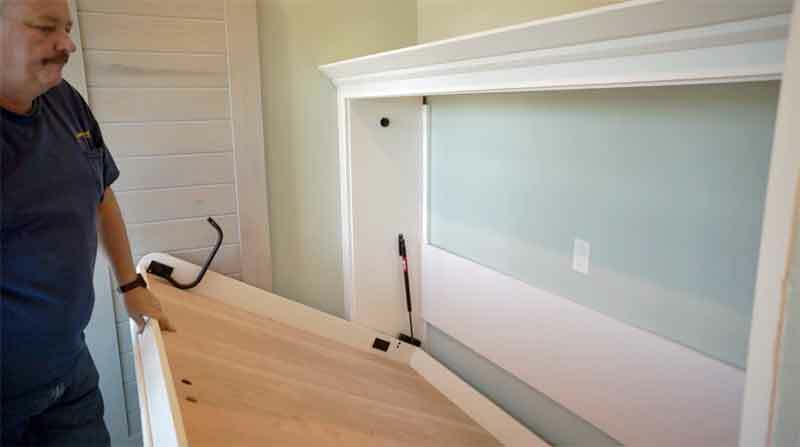 Add the angle brackets to your Murphy bed and then attach them to the wall by moving your Murphy bed against the wall. After you’ve completed these steps, you’ll just need to go back to your Murphy bed to finish setting it up if you haven’t already done so. Some models will ask that you set the bed up first and others will ask that you mount the frame to the wall first so make sure you follow the instructions that were included with your bed. If your Murphy bed does not need to be mounted to the wall, you’ll still need to take some extra precautions. My advice is to try to place the Murphy bed in the most level area of your room. If you’re placing your bed in an area that is on a slant, you may want to attach the bed to the wall even if the instructions do not call for it. To do this, you’ll just need to buy some angle brackets and some screws as your bed will not come with them if the installation process does not call for their use. Did you know that many Murphy beds are actually mounted to the floor instead of the wall? I didn’t either until I started researching them. This mounting procedure isn’t any more difficult but it does cause more damage. A hole in the drywall can easily be patched after you’ve moved your Murphy bed, a hole in the floor cannot. To mount your Murphy bed to the floor, you’ll need to drill holes through it. You might also have to put some bolts down as screws aren’t always enough with a floor mounted Murphy bed installation. Before doing this, however, you’ll need to make sure that there aren’t any pipes or wires in the spot you’re drilling into. This can be done by looking at the home’s blueprints or by opening up the ceiling in the room underneath. These steps are more onerous then running a few screws into the wall but are sometimes worth it as floor mounted Murphy beds are incredibly easy to open and close. One way to get around this mounting option is to take a thick board and mount the floor mount to this board. The board can then be mounted to the wall so that you end up with a bed that is mounted to a fake floor and a floor that is mounted to the wall. In this case, you’ll follow the steps for mounting a Murphy bed to the wall so that you can have your board mounted onto solid wall studs. If you’re intent on mounting the Murphy bed to the floor, be prepared to leave it there permanently. The Murphy bed will actually become a fixture of the house in this case and if you sell your home they may expect you to leave it behind. Most Murphy beds will need to be mounted to the wall but this isn’t something everyone wants to do. If you’re living in a rental unit or plan on moving your Murphy bed from room to room, you may want to find a Murphy bed that doesn’t need to be screwed to the wall. In this instance, you’ll probably want to find a Murphy bed that has a lot of weight at the bottom. Weighted Murphy beds bring the center of gravity back to the bottom and help to keep the Murphy bed from toppling over. Another option would be to buy a horizontally mounted Murphy bed as this type of bed naturally comes with a lower center of gravity. These beds make great low-lying shelves as they are not mounted nearly as high as vertically mounted beds. This is especially true for twin Murphy beds which may end up being shorter than three and a half feet tall. A Murphy bed is built on a frame that rotates down and out of a larger frame. The larger frame can be built into the wall and it can have many different items attached to it. For example, the outer frame may have shelves or built-in end tables connected to it. Typically the frame rotates down on hinges, springs, or pistons. DIY enthusiasts will often use the swivels that are sold with boat seats as they are inexpensive and sturdy. For an easy to lift Murphy bed, you’ll want to go with a bed that has gas pistons built into it. These pistons help to lift the bed into place and a good set of pistons will allow almost anyone to lift a Murphy bed up and down with ease. Yes. Most Murphy beds make use of standard mattresses. The only issue you really have to consider when using them is the thickness of the mattress versus the thickness of the frame. You might need to go with a 6-8” foam mattress for some types of Murphy beds. If you try to place a mattress that is too thick on your Murphy bed, it will not close. Most Murphy beds will allow you to put a 10″ mattress on them which is thick enough to be comfortable for most people. I actually slept on an 8″ mattress for the last decade and thought that it was one of the most comfortable beds I’d ever owned. Yes. The comfort of a Murphy bed is dictated by the mattress that has been placed inside of it. A Murphy bed with a good mattress is as comfortable as any other bed. If you buy a nice mattress for your Murphy bed it will most likely be comfortable to sleep on. Conversely, if you buy an uncomfortable mattress, your Murphy bed will be uncomfortable to sleep on. There are multiple ways to install a Murphy bed and many Murphy beds don’t need to be installed at all. Before buying a Murphy bed it is always a good idea to find out what kind of installation will be needed to make it work. Floor mounted Murphy beds are the easiest to open but the hardest to install and Murphy beds that do not require any installation are usually the hardest to open and the least stable. Wall mounted Murphy beds are the most popular and you’ll find that they are relatively easy to open and not very difficult to install. Place a comfortable mattress on a properly installed Murphy bed and you’ll have a comfortable bed to sleep on.